Yves Parlier’s latest innovation : traction by 100% natural energy to innovate for the transport of tomorrow. 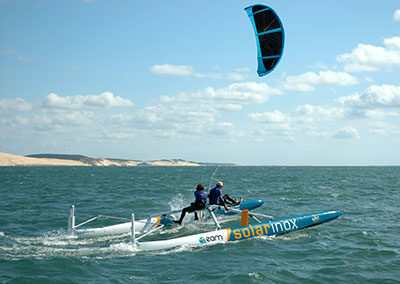 A new way of considering the sea, in association with wind and solar energies. The principle of the stepped hull was invented to enable the seaplanes to take off and land at high speed. They enable to obtain a dynamic strain on water and facilitate the squat of the hulls at a certain speed. They also avoid braking during take off and landing. The hull’s speed is thus not limited. Some seaplanes take off at a speed of more than 250 km/h and some engine catamarans using stepped hulls can reach a highest speed of 260 km/h. 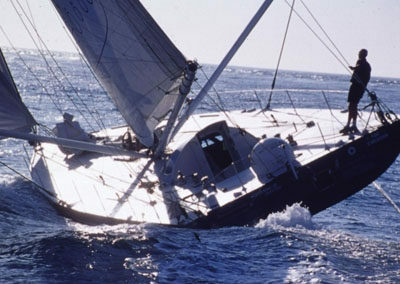 Multihulls of today function thanks to the Archimedes’ principle whatever their speed may be. The drag of such hulls increases with the speed squared blocking the access to averages ranging from 40 to 50 knots. Thanks to stepped hulls or seaplane hulls, the dynamic lift centre is forward of the hydrostatic lift centre and enables it to be opposed to the pitch down momentum of the aerodynamic force. Our multihull when reaching a certain pace will come out of the water and be borne by 3 m2 forward of the step. At 40 knots, the drag of the stepped hull is 4 times lower than that of an Archimedean hull and remains stable at any speed. Once mastered, this innovation enabled us to explore new speed limits. Seaplane hulls are structurally more reliable and thus enable us to fulfil perfectly our initial specifications: sail faster and safer. Our aim being that of building a lighter boat, it implied the need to design a catamaran allowing the removal of the central hull. 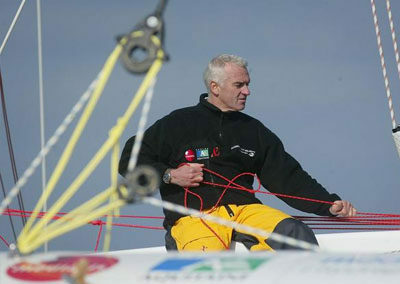 On the other hand, to optimise both the sail area and the height of the lift centre, to double the rig was necessary. It’s thus the configuration of a two wing-masts (rotary and non-canting) placed on the forward beam, 1,50 meter inwards of the platform, which was retained. The double rig exerts its strain almost at the level of the hulls, thus enabling shaped beams to provide the link between the two hulls and not to support a single mast. Moreover, with a fast multihull, by light or medium wind, the relative wind, even when running, is located forward the abeam which enables the leeward rig to avoid being masked by the windward rig. On an equal sail area with the trimarans, the air draught of 24 meters (height of the mast: 22 meters) is by far lower which makes it reliable. Rotating wing masts had been mounted on multihulls (much wider than monohulls), never on monohulls, so this was a first! 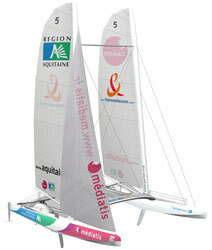 The design had to be modified for use on a monohull. 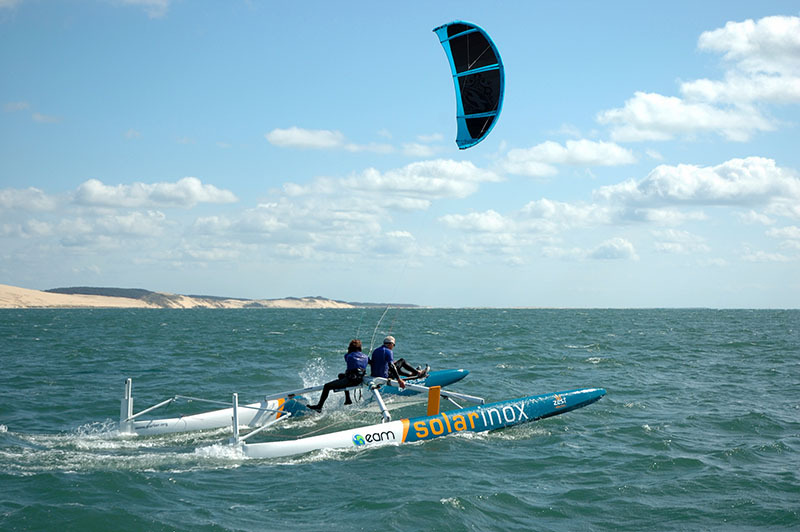 This type of mast has an aerodynamic cross-section (40cm x 18cm) and turns according to the wind direction. The wing mast and sail form a unique profile that facilitates laminar air flow and prevents turbulence. 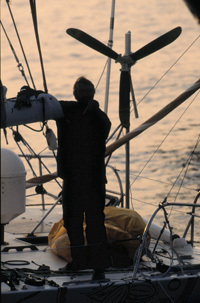 The performance gain using this technology is estimated to be three days on a round-the-world voyage compared to a day and a half using a raked keel. 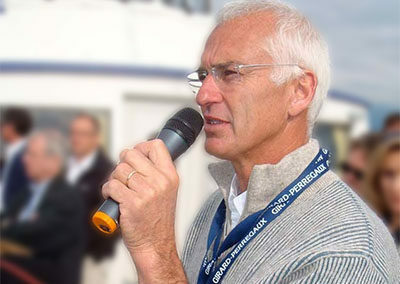 Thanks to developments in resin technology, Yves Parlier was able to design a built-in reel in 1993, which reduced the yacht’s overall weight by about 350 kg. Today, many other monohull and multihull yachts use carbon reels. 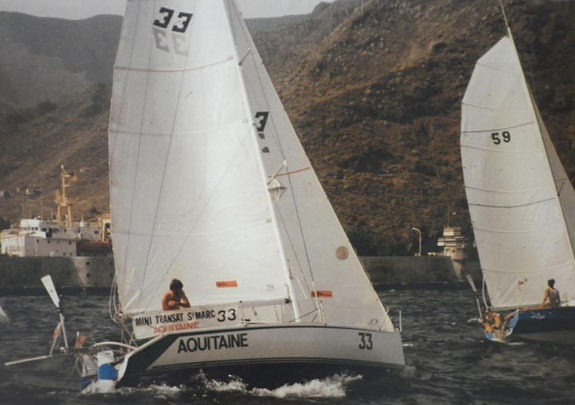 In 1985, Yves Parlier built his first yacht, Aquitaine, in which he went on to win the Mini transatlantic race. Thanks to his composite engineering training and huge interest in innovative techniques, he made and installed the first filament-wound carbon mast. 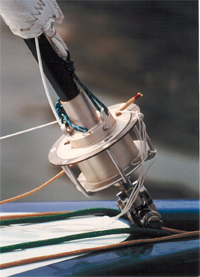 This technology has since been used for most racing yachts. The traditional method of constructing a hull uses a “sandwich” of foam between two carbon skins. 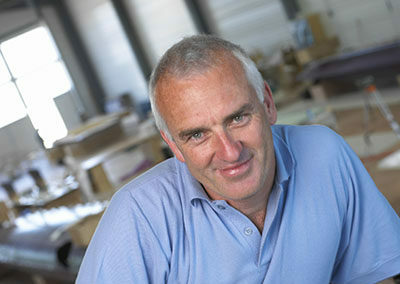 Yves Parlier, a composite engineer, proposed an innovative solution using a single carbon skin reinforced with pultruded ribbands. This choice of a single skin makes the hull more reliable and durable. 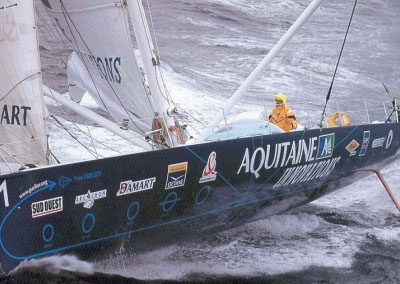 In 1996, we developed a research programme testing the use of wind, sun, and bio-fuels to produce electricity on board Aquitaine Innovations. 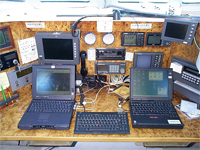 Electricity is vital for operating electronic and computer equipment on board a yacht, but above all for the automatic pilot. 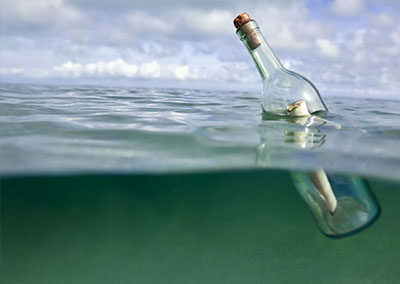 A solo yachtsman cannot steer all day and must, therefore, be able to rely on his instruments. The automatic energy management system ensures that the on-board batteries are automatically recharged without the skipper’s intervention. 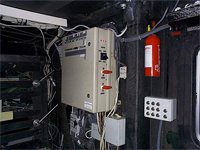 It is every sailor’s dream to have a trouble-free electrical system on board. This smart system makes optimum use of the nickel-cadmium batteries and they do not lose power over time. 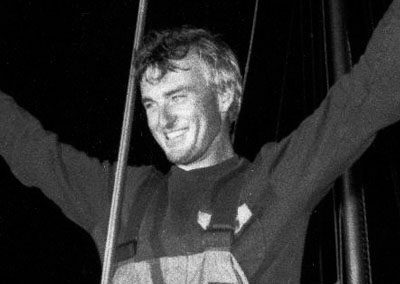 In 1998, Yves Parlier was the first to achieve the technological feat of transmitting TV-quality images almost live from the open seas. 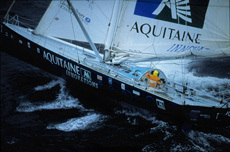 On Aquitaine Innovations, a remote-controlled digital camera system recorded images onto magnetic tape as well as digital data onto the yacht’s computer. Once these images had been logged on the on-board computer, they were transmitted by a high-performance communication system. The high-quality images and sound received in Bordeaux were then broadcast to the media. 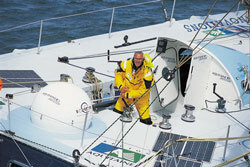 These systems were designed by Seastem and installed on the catamarans in The Race.